A woman wearing a blue Snuggie. A sleeved blanket is a "As seen on TV" body-length blanket with sleeves usually made of fleece or Vellux material. It is similar in design to a bathrobe that is meant to be worn backwards (i.e., with the opening in the back). The product has been marketed by various brands as the Snuggie, Snuggler, Doojo, Toasty Wrap, and Slanket, with varying sizes, colors and qualities of materials but similar basic design. The "Snuggie" brand itself also became a phenomenon of pop culture, outselling other brands and being referenced or imitated by many comedians or TV shows. Spectators attempting to break the Guinness World Records record for the "largest gathering of people wearing fleece blankets" at Angel Stadium of Anaheim on April 6, 2010. On March 5, 2010, at a Cavaliers game, Snuggie wearers broke a world-record for sleeved blanket wearing. Over 22,500 fans wore custom-made, limited edition Cleveland Cavaliers Snuggie blankets for 5 minutes. A Guinness World Records representative was on hand to present the official World Record certificate to KeyBank, the Cavaliers and Snuggie. 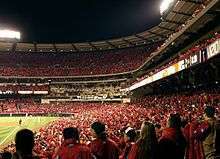 However, in just a little over a month the feat was broken during a Los Angeles Angels of Anaheim home game when over 40,000 spectators wore a promotional Hideki Matsui sleeved blanket for five minutes. Little child in a Doojo sleeve blanket. A blanket called GO-GO Blanket holds the US patent for child-sized sleeved blankets. 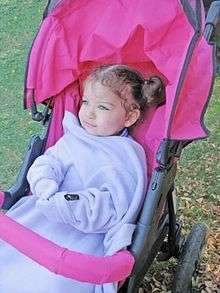 GO-GO Blanket was created as a travel blanket for children (up to size 5) which complies with federal safety regulations for car seats and strollers. GO-GO Blankets were created in 2007 by a grandmother in New Jersey who wanted to find a solution to keeping children safe and warm in a car seat without bulky winter wear. ↑ "How to tell the difference between a Snuggie and ...". Chicago Sun-Times. January 31, 2009. Archived from the original on February 2, 2009. ↑ Celizic, Mike (February 4, 2009). "Matt said he'd never wear a Snuggie, but...". Today's Family Blog. NBC News. Retrieved February 8, 2009. ↑ Schmidt, Mackenzie (December 21, 2009). "2009, The Year of the Snuggie: A Handy Timeline From "The WTF Blanket" to Weezer's Wuggies". The Village Voice.